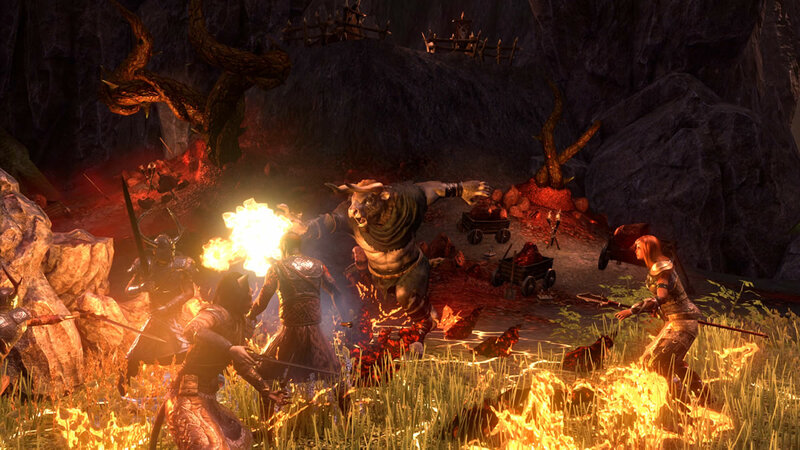 The first DLC of The Elder Scrolls Online was released on August 14 since the launch of ESO Morrowind in June. The Horns of the Reach DLC introduces two incredible new dungeons - Falkreath Hold and Bloodroot Forge - plus several new items. Being released simultaneously with Horns of the Reach are several basic gameplay improvements available to all players for free, as well as a new mode for the PvP battlefields, Chaosball, and a new map, Arcane University. The Horns of the Reach pack with both dungeons is now available for PC and Mac, free for ESO Plus subscribers or in-game purchase through the Crown Store for 1500 crowns. The general improvements of Update 15 are also freely available to all players. PvP mode news is free for those who have purchased ESO: Morrowind (the battlefields require Morrowind). Both will be released for the PlayStation 4 and Xbox One on August 29. Bloodroot Forge and Falkreath Hold, two new challenging dungeons, place four-player groups against the threatening hordes of the Dreadhorn Clan. The two dungeons contain unique item sets, monster masks, achievements and collectibles. For more details on the story, enemies and rewards, check out the introductory articles on Bloodroot Forge and Falkreath Hold on ESO's website. Horns of the Reach is also available in a special collector pack, which offers a unique selection of Horns of the Reach themed items along with the DLC package, including the Karthwolf Charger mount, Karthwolf Shepherd pet, and five Crown Experience Scrolls. This exclusive set will be available for a limited time in the store for 3500 crowns. Along with Horns of the Reach, ZeniMax Online Studios also released Update 15 for PC and Mac, implementing several game improvements that are free for all gamers, as well as great news for PvP, which are free to ESO owners : Morrowind. The new PvP battlefields include a new arena - Arcane University - which is at the heart of Cyrodiil's ruined university, and a new game mode, Chaosball, where players need to capture and protect a "ball" to gain points for Your team. For more information, visit the Battlegrounds preview site. General Update improvements - free for all players - include tweaks, balance improvements, and news that everyone can take advantage of. For the complete list of changes, see the update preview page on the ESO-GOLD website.